THE packed stadium pulses like the insides of a gigantic red-and-blue anemone. Down on the sparkling green pitch, a lone figure in orange awaits his fate, like a man forcing his eyes open in front of a firing squad. A dark-haired goliath places a ball on the turf. He wears the famous striped blaugrana of the Catalan champions, the claret and blue. Every single person in the crowd bows to him, calling: "Ibra! Ibra! Ibra!" The man in orange, the opposition goalkeeper, adjusts his gloves. Behind him, an enthusiastic Catalan beats a bass drum. Boom! Boom! The crowd, all 99,000 of them, respond with a clap. It's as though the sky has ripped open. Boom! Boom! CLAP! Boom! Boom! CLAP! The goalkeeper shuffles on the spot. The giant Ibra starts his move on the first boom, and drives the ball as 198,000 hands come together with an enormous CLAP! The poor man in orange doesn't stand a chance. The crowd erupts. 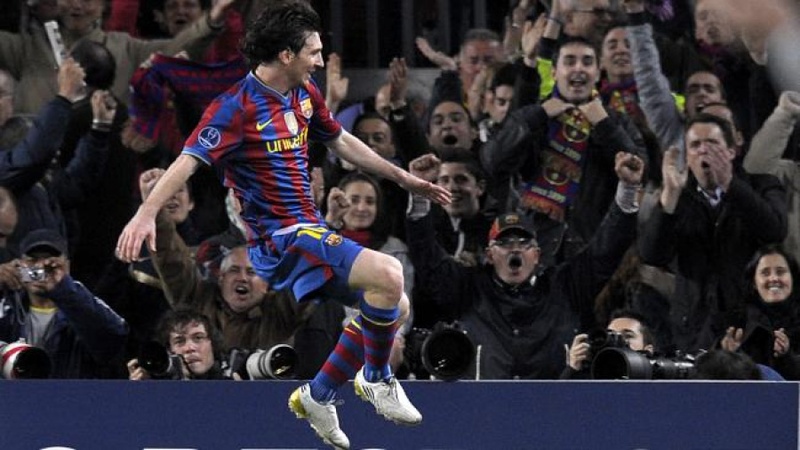 Every single person rises and cheers "Barca! Barca! Barca!" while the announcer screams "GOOOOOOAL". This is why I've come to Camp Nou, home of one of the most famous football teams in the world, to experience the collective madness of European soccer, Barca style. I'm no stranger to the amazing city of Barcelona. I've stared open-mouthed at the fantastic art and architecture, adventured down myriad twisting medieval lanes, thirstily sculled cold beer in tiny bars while savouring intriguing tapas and strolled along the golden beachfront, weaving between roller skaters and every hue of bikini-clad model. But I still hadn't taken in the ultimate Barcelona experience - futbol. I must admit, when I started clicking on the website for tickets, I felt a twinge of trepidation. Crowds in Australia are as safe as a Wiggles concert, but European football conjures up worrying images of burning grandstands and crazed neo-Nazis. My friends shook their heads, sure they would not see me again. But I knew I'd be fine. I had a brilliant grandstand seat on the halfway-line. It was expensive 100 euro but the website lets you see your view and I loved it straight away. Football teams don't get more exciting than Barca. It is the most successful club in the world, holding five major cups, including the European Champions League Cup. Barca boasts some of the most skilled players in boots, including boy-faced Argentine Lionel Messi, giant Yugo-Swede Zlatan Ibrahimovic and the captain and favourite Carles Puyol featured on just about every billboard around town. For such a flamboyant team, the name of their home ground, Camp Nou, seems to lack spark. But there's a story behind that, one that goes to the very heart of the Barca identity, one that is much bigger than football. It all harks back to the Spanish Civil War eventually won by Generalissimo Francisco Franco, who ruled Spain long after other European fascists had immolated themselves or been strung up on lamp posts. During the war, the fascists blew up the Barca clubhouse and shot the president. After the war, Catalonia was still considered a bastion of leftist resistance and the language was banned. Everywhere, that is, except at the Barca home ground. So football matches became imbued with the sound of whispered rebellion. According to legend, Franco feared the club so much he arranged for visits from the secret police to sway the results of important matches, most notably the 1943 final of the Generalissimo's Cup. Barca went from leading Real Madrid 1-0 to losing 1-11 after some half-time suggestions from Franco's men. Little wonder the Barca and Real El Clasico is the most fiercely contested match in the football world. Barca built a new ground in 1957, but Franco wouldn't let them call it after their founder Joan Gamper because he was a leftist and a Protestant to boot. They declined to call it anything at all. The name Camp Nou, or new ground, stuck. The more I learned about the club, the more impressed I became. Barca's motto is mes que un club (more than a club). Maybe they are. A billionaire oil magnate doesn't own Barca, but 170,000 members do. It has supported its millions of Third World fans, giving away the shirt off its back literally. Forsaking a fortune in shirt sponsorship, the players instead wear UNICEF proudly on their chests as part of a program to fight AIDS among African children. It is the only time the blaugrana has featured a logo. To get even better acquainted with the spirit of Barca, I went to the Camp Nou museum. With 1.3 million visitors a year, it's the most popular museum in Catalonia and the most popular sports museum in the world. It's not just a stuffy museum full of winners' cups, although there are hundreds of them. You can also take a tour of the stadium, which includes the opposition dressing rooms, the interview rooms, the player's chapel (please God, send me a goal! ), a chance to see the view from the chairman's seat. Best of all is the walk through the players' tunnel. As you take the last few steps on to the pitch, you briefly imagine yourself as Messi or Puyol, ascending the worn concrete treads to appear before the adoring crowd. By the time kick-off came in the Barcelona-Zaragoza match, I was already a die-hard supporter. Earlier concerns about Euro violence dissolved. Around me were families, from greybeards with grandchildren to giggling schoolgirls in Messi shirts. In fact, the family-friendly atmosphere reminded me of a Sydney Swans crowd - good-natured, but ready to explode with passion at a moment's notice. And the game. What a spectacle! Overshadowing the sheer talent on display was the realisation these millionaire players were doing what they loved and it showed. They beamed as they tricked the ball into the back of the Zaragoza net six times. The players were having the time of their lives and so were 99,000 of their supporters...including one new fan all the way from Australia. Getting tickets: Tickets for big matches such as El Classico against Real Madrid are extremely difficult to purchase as members hold on to their tickets until two days before the match. It's then an online scramble to pick them up. Book in advance as soon as tickets become available. Prices: Ticket prices vary from 41-225 euro, depending on the seat and the opposition. For a general seating at a La Liga match, it is up to 225 euro for a grandstand seat at El Classico. It is highly recommended to get a seat in the second tier of the grandstand, where a perfect view is just about assured. Getting to the ground: The Green Line metro station Les Court is a 10-minute walk. If you have small children, wait a while after the match to avoid the crush. This story originally appeared in the Australian newspaper and online .